Beautiful stock certificate from the Benoist Aircraft Company issued in 1912. This historic document has an ornate border around it with a vignette of a seated woman. It also has an underprint of an early Benoist Bi Plane This item is hand signed by Thomas Wesley Benoist and is over 87 years old. The certiifcate has been folded in thirds and has some slight seperation at the seams. The history of aviation began with the Wright Brothers in December, 1903 in Kitty Hawk, North Carolina. As aviation progressed, companies pioneered the scheduled transport of passengers by air. On January 1, 1914, the Benoist Company scheduled passenger service (World's First Airliner - Benoist Type XIV) from Tampa to St. Petersburg with a five dollar fare. The Benoist "Air Boat" made its first flight over Tampa Bay (25 miles at 60 mph) on January 12. TOM BENOIST Born Dec 29, 1874, Irondale MO. Died June 14, 1917. Thomas Wesley Benoist moved with his family to St Louis in 1983, where he had his first experience with flight on a balloon ride in 1904. He and his brother, Charles, started in business first in 1907 as an automobile supply house, but a year later changed their direction as the Aeronautic Supply Company, the first of its kind in the USA. Aerosco, as it became popularly known, sold not only raw materials, parts, and motors, but featured Curtiss and European biplanes in its 52-page catalog. There Tom developed his newfound interest in designing flying machines. By 1909 he had his first airplane, an old Curtiss pusher that he had rebuilt and modified as a prototype for three others, but he had never flown any of them. So, his first flight in September 1910 was his solo flight -- a journey of 600' at an altitude of 50' -- which also made his the first St Louis resident to fly. With skills evolved from subsequent flights, Benoist opened a flying school at the city's new Kinloch Field, where by mid-1911 more than a dozen students from around the world had learned to fly -- one of them was Tony Jannus, who would become his chief instructor and collaborator in designing aircraft. Production was mostly undocumented, and only one report of a total 106 aircraft built by the various Benoist operations was noted, but the products were well-known and the company was a major manufacturer of the period. Benoist and Jannus also received US patent #1,053,182 for their invention of a tethered parachute "dispenser," which Bert Berry used to make the world's first successful jump from a plane on March 1, 1912. In early 1913, the pair made plans for a mid-year transatlantic flight to try for the $50,000 prize announced by Lord Northcliffe, in which Jannus would follow a steamship until 100 miles from the Irish coast, then fly ahead to land. However, their plans fell through when the Roberts Co would not to loan them a vital 100hp motor. Things began looking up when a three-month contract was awarded for a St Petersburg-Tampa airline to begin New Year's Day 1914, the world's first scheduled passenger service. Service ended on March 30, and while losing money in the venture, they proved the feasibility of commercial air service by carrying 184 passengers safely on 97 trips. Business went back into a slump, and Jannus left. Without city support, Kinloch Field became virtually deserted, so in January 1915 Benoist moved operations to Chicago. There he reached an tentative agreement with the St Louis Car Co to build 5,000 airplanes to sell at $6,100 each; however, only two prototype Model 15s came of the idea, and Benoist moved his shrinking business into the Roberts Motor Co factory at Sandusky OH, where only four aircraft were reported built. Struggling to pay bills and keep remaining employees from deserting him, there was a sudden bright ray when in December 1916 he was approached by the government about an order, and Admiral Peary was scheduled for a meeting with Benoist and the Roberts people in late June 1917. Benoist was also negotiating with financial backers about his eight-passenger, twin-motored Model 17, when he hopped off a moving trolley one fateful day and struck a light pole. He died within hours at age 43. FIRST COMMERCIAL AIRLINES St. Petersburg, Florida, is not generally considered a city that can boast of an aviation "first." 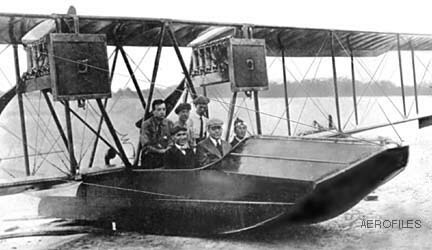 But on January 1, 1914, the St. Petersburg-Tampa Airboat Line was born there--the world's first scheduled airline using winged aircraft. A plaque on the entrance to St. Petersburg International Airport proclaims: "The Birthplace of Scheduled Air Transportation." Traveling in that first passenger airplane made of wood, fabric and wire was a far cry from flying in today's comfortable, air-conditioned airliner. From all accounts, however, those first airline flights were not so bad, provided you did not mind sitting out in the breeze with water spraying in your face. Passengers sat on a wooden seat in the hull of a two-place seaplane that did not have a windshield and rarely flew more than five feet above the water. That is the way it was on that momentous day in sunny Florida only a decade after Orville and Wilbur Wright made their historic first flights at Kitty Hawk, N.C. 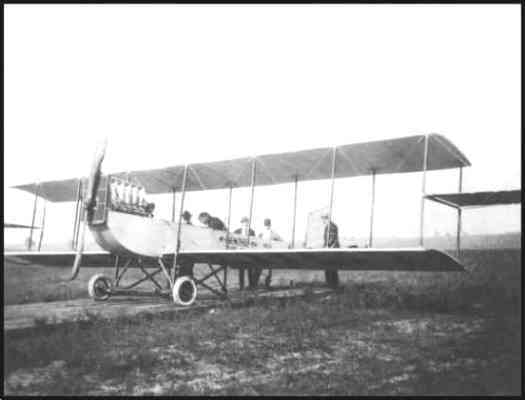 The aircraft in St. Petersburg was a Benoist (pronounced Ben-wah or Ben-weest) Model 14, built by St. Louis manufacturer Thomas W. Benoist. Best known for the sparking batteries and automobile self-starters he manufactured, Benoist also built 17 different models of landplanes and seaplanes between 1910 and 1917. His aircraft advertisement claimed: "My plane is figured down to the last equation, and improved up to the second. Every nut, bolt, wire, wood member, and piece of cloth is examined, tried and tested before it goes into our machines. Some others may be built as good, but none are built better, because we use the best of everything." An early aviation visionary, he said he often "dreamed of the skies filled with air lanes carrying the world's passenger and freight traffic." The pilot on that historic January 1914 flight was Antony H. Jannus, a Benoist test pilot and instructor who had carried Captain Albert Berry aloft to make the first parachute jump from an airplane on March 1, 1912. Jannus flew a number of exhibitions demonstrating Benoist planes throughout the Midwest and was a contestant at a Chicago air meet in September 1912. Later that month, he established an American passenger-carrying record by taking three men with him on a 10-minute flight. On November 6, 1912, flying an early model Benoist on a single float, Jannus and J.D. Smith, his mechanic, left Omaha for New Orleans in an attempt to set a distance record for winged aircraft. Although it took six weeks to make the 1,973 mile trip because of stops for exhibitions, a near-disastrous fire, repairs and a bout with appendicitis, Jannus received wide acclaim in the newspapers as "the pioneer flying-boat pilot of the world." Shortly thereafter, he was credited with setting a "continuous flight with passenger" record by flying the 251 miles from Paducah, Ky., to St. Louis in four hours, 15 minutes. Jannus, who was born in Washington, D.C., in 1889, had been employed by the Emerson Marine Engine Co. in Alexandria, Va. He had been sent to the airfield at College Park, Md., in November 1910 to install a marine engine in a modified Curtiss-type airplane with Farman landing gear, made by Frederick Fox and Rexford Smith, and was instantly obsessed with learning to fly. He began flying after receiving only cursory instructions and was soon making cross-country flights at altitudes up to 300 feet. Jannus flew several times from the Polo Grounds in Washington and made some air-to-ground radio tests for the Signal Corps. In July 1911, he traveled to St. Louis, where he was hired by Benoist as a flying instructor. Roger, his older brother, a graduate of Lehigh University, also was caught up in the excitement of flying. He later joined Tony at the Benoist factory and took lessons from him. The driving force behind the St. Petersburg� Tampa Airboat Line was Percival Elliot Fansler, a Florida sales representative for Kahlenberg Brothers, a Wisconsin manufacturer of diesel engines for fishing boats. He became fascinated with Benoist's progress in aircraft design and manufacture. He recalled later: "My appetite for speed was whetted by my experiences in racing boats. Having heard that Tony Jannus had made his famous trip down the Mississippi in a flying boat, I started correspondence with Tom [Benoist]. After receiving two or three letters that dealt with the details and capabilities of the boat, the idea popped into my head that instead of monkeying around with the thing to give 'jazz' trips, I would start a real commercial [air]line from somewhere to somewhere else. My experience in Florida led me to conclude that a line could be operated between St. Petersburg and Tampa. The distance was about 23 miles--some 15 of which were along the shore of Tampa Bay, and the remainder over open water. I wrote to Tom about the scheme and he became immediately enthusiastic." Fansler agreed to go to Tampa, select a suitable seaplane route and make all the business arrangements. Benoist promised he would furnish three airboats, mechanics and pilots if Fansler was successful in getting some financial backing. Fansler immediately wired Benoist to come to St. Petersburg. On December 17, 1913, Benoist signed the world's first airline contract for heavier-than-air planes. The day after the contract signing, the St. Petersburg Times reported that "a fleet of hydro-aeroplanes" would make regular trips between St. Petersburg and Tampa, and predicted that the service would "prove to be of great benefit to the city." When queried about the safety of the operation, Fansler said, "there is no more liability of accident in one of the boats than in an automobile, and the airboat will seldom be more than five feet above the water." Fansler, as general manager of the airline, fixed the price of a one-way ticket at $5 for the 22-minute trip. Passengers were allowed a maximum weight of 200 pounds gross, including hand baggage. "Excess weight [was] charged at $5 per hundred pounds, minimum charge 25 cents," according to the handbills distributed throughout the two cities. Besides operating two scheduled flights per day, six days a week, Fansler recalled that "our agreement with our backers permitted us to indulge in special flights at any price we cared to name, and we made a number of these trips at $10 to $20 each." In addition to starting the airline, Fansler announced that a training school for pilots would be established. Three Benoist airboats were shipped from the St. Louis factory for both purposes. One was a Model 13; the other two were Model 14s. The Model 13 was to be operated by the school for instruction, and the 14s were to be used for passenger transport. A large, open-ended hangar was planned. The first of the two Model 14 Benoist airboats, No. 43, arrived by train from Paducah, Ky., and was promptly assembled. It weighed 1,250 pounds, was 26 feet long and had a wingspan of 44 feet. Although the plane was built to hold only a pilot and one passenger on a single seat, sometimes two small passengers could be accommodated. Tony Jannus gave it two test flights on December 30 and 31, 1913, accompanied on one of them by Benoist's chief mechanic, J.D. Smith, and on the other by a local man named J.G. Foley. Smith, whom Jannus called "Smitty, the Infallible," was especially adept at maintaining the Roberts 6-cylinder, in-line, liquid-cooled, 75-hp engines that Benoist used in his planes. Smith had raced motorcycles as a young man, and when he read about Benoist in 1912, he left his home in Jamestown, Pa., for the St. Louis plant. Benoist found him voluntarily sweeping snow off a plane in subfreezing weather and hired him on the spot. The hull of the Benoist flying boat was made of three layers of spruce with fabric between each layer. The Roberts engine and a pusher propeller gave the aircraft a top speed of 64 mph. The wings were of linen stretched over spruce spars. It was claimed, though not accurately, that the Benoist was the only plane in the world at the time that had the engine placed down in the hull. The plane was touted for publicity purposes as "a motor boat with wings and an air propeller." It was priced at $4,250. Although this early Benoist had greater stability than later models, the low placement of the engine proved to be a maintenance headache. The propeller had to be located high enough to avoid the water spray, and the connection between the engine in the hull and the pusher propeller required a chain drive that often slipped off its track. Later Benoist models had one or two 100-hp Roberts direct-drive engines mounted under the top wing. By New Year's Day of 1914, the continual attention the local paper was giving to the promised inauguration of scheduled flights had built up intense interest in the new venture. After a parade from downtown St. Petersburg to the waterfront, an Italian band from the Johnny Jones Show played at the municipal pier as Jannus readied the airboat for flight. A crowd of 3,000 looked on while a ticket for the first flight round-trip to Tampa on the airline was auctioned off. Former Mayor Abraham C. Pheil won the honor of being the first airline passenger with a bid of $400. The airline donated the money to the city for the purchase of harbor lights. Fansler made a short speech as the airboat was being placed in the water, "What was impossible yesterday is an accomplishment today, while tomorrow heralds the unbeliev able," he concluded. At 10 a.m. the ex-mayor donned a raincoat, stepped gingerly into the hull and sat on the small wooden seat beside the pilot. Jannus started the two-cycle engine and tested the controls. He waved to the crowd, taxied out and took off into history. Halfway to Tampa, however, the engine began misfiring, and he landed in the bay briefly to adjust it. He took off again and, 23 minutes after the original takeoff, landed at the entrance to the Hillsborough River before an excited crowd of 2,000. Police held the crowd back as Jannus and Pheil obliged a cameraman who asked them to pose for pictures. A reporter from the Tampa Tribune asked Pheil why his hands were all greasy. He replied that it was from "assisting Mr. Jannus to adjust some machinery." Pheil went to a telephone and called St. Petersburg to announce their arrival. Jannus and Pheil left Tampa for the return trip at 11 a.m. and arrived back in St. Petersburg before another cheering crowd. Just before the afternoon flight, a second auction was held, with Noel A. Mitchell the successful bidder for a round-trip flight at $175. The next day, Mrs. L.A. Whitney, wife of the secretary of the Chamber of Commerce, made the flight to Tampa and back to become the first woman passenger to fly on a fixed-wing scheduled airline. (Actually, Mae Peabody of Dubuque, Iowa, was the first woman to make a local flight out of St. Petersburg.) Whitney described the flight as "the most delightful sensation imaginable--it is like being rocked to sleep in your mother's arms." The St. Petersburg Times announced that it had signed a contract with the airboat line to fly papers daily to Tampa, which would make it "the first newspaper in the world to use flying machines for delivery purposes." The announcement added, "This will be the most unusual carrier system in all the world and Tampa readers, when they receive their copy... will read a newspaper delivered as no other." The Tampa Tribune noted that the first flight had been made "without mishap" and gave the event a banner headline in its January 2 edition--"The First Commercial Air Ship Line Inaugurated." The article stated: "When the airboat arrived yesterday morning, a crowd of 2,000 was waiting near the temporary landing [site], another 1,000 saw what they could from the Lafayette Street bridge, and 500 more were across the river. When the dock was reached, an enthusiastic cheer went up, and there was a clapping and the waving of hats and handkerchiefs. A moment later, there was a rush down the three narrow planks connecting the platform with the shore; men, women and children [were] fighting to get down to the boat and its two occupants." There was amused reaction from other state newspapers. The Jacksonville Metropolis editorialized that "St. Petersburg is now a city of pelicans, porpoises & planes." Its rival, the Jacksonville News, advised: "St. Petersburg papers might secure an obituary sketch of all aeroplane passengers at the same time they take the passenger manifests. It might save time." The Estero Eagle asked, "Is Tampa such a tough and wicked old city that its residents are preparing to fly from it?" The Tampa Tribune responded to that question a few days later: "All airboat passengers have been from St. Petersburg and are apparently eager to get to Tampa." The St. Petersburg Independent replied: "It is noticeable that the time from Tampa is always faster than the time to Tampa. Once having reached Tampa, no matter how anxious to get there, the passengers are always in a hurry to get away." Jannus' flight records show that an additional five short flights of about 10 minutes each were made that epic day. He noted that the engine was burning 13 gallons of fuel and about a gallon of lubricating oil per hour of flight. Local merchants took advantage of the airline's sudden renown to advertise that their wares were being transported by air. A Tampa florist filled orders to St. Petersburg for as much as $50 worth of cut flowers a day. The Hefner Grocery Co. in St. Petersburg ran an ad touting Swift premium smoked hams and bacon that had been delivered by "Airboat Express." The ad said, "Although they came high, the price is low." Some mail was carried but not on government contract. The other two airboats, one a Model 13 and the other a 14, arrived on January 31. Roger Jannus was to be the backup pilot. Heinrich Evers, a German, and Byrd Latham enrolled as students, and both soloed at St. Petersburg. Evers wrecked the Model 13 on its second flight. The airline operated successfully for the three-month period. A total of 172 regular trips were made, and 1,205 passengers were carried (some two at a time) for an estimated 7,000 air miles. Of the 50 days scheduled for flying, only seven days were lost because of weather or maintenance problems. On one flight, however, Jannus had to land in choppy water when the engine ran rough because of dirt in the carburetor. One pontoon and a portion of one lower wing were damaged. Fansler reported that Jannus fixed the carburetor, "got the boat into the air again with skill and flew on in with a portion of the wing hanging like the broken wing of a bird." On another forced landing due to engine problems, Jannus hit a submerged object and the boat hull sprang a leak. As Gay Blair White notes in The World's First Airline, "This was the only case in which a passenger got his feet wet, and he would not, if he had stayed on the machine until a motor boat came out and took him off. However, as the boat had four air-tight compartments and none of these were punctured, the damage caused by the accident was trivial." According to Fansler, the demand for reservations remained high: "We had a waiting list a yard long, and not once did we have to fly without a passenger." In addition to the scheduled trips, about 100 charter and sightseeing flights were reported in the two Model 14 airboats. Repair costs were stated as less than $100. An estimated $12,000 in fares was taken in, but local historians believe that the freight cost of getting the planes to Florida, employee wages and gas and oil allowed only a small profit. On March 28, as the contract expiration date neared, Benoist said, "We have not made much money, but I believe we have proved that the airplane can be successfully used as a regular means of transportation and commercial carrier." The airline operated for another five weeks after the March 31 contract termination date, but passenger interest declined rapidly as the "snow birds" (winter residents) retreated northward. On April 27, Tony and Roger Jannus, apparently bored between scheduled runs, raced each other several times over an eight-mile course. The last official airline flight was made on May 5, 1914. The two Florida cities are proud of their aviation "first" and have reminded the aviation community about it each year since 1964. To celebrate the 50th anniversary of the historic flight, the St. Petersburg and Tampa chambers of commerce established the Tony Jannus Award. The award is given annually on Tony Jannus Day to an individual "who has contributed to the growth and improvement of the scheduled airline industry." The first recipient was U.S. Senator A.S. "Mike" Monroney (D-Okla.), who sponsored progressive federal aviation legislation. Other recipients include Jimmy Doolittle, Juan Trippe, Eddie Rickenbacker, C.R. Smith and Donald W. Douglas. Recent winners were Herbert D. Kelleher of Southwest Airlines; Alan Boyd, former secretary of transportation; and Martin Schroder, founder of MartinAir. A flying replica of the 1914 Model 14, No. 43, was constructed by George Hayes, Russell St. Arnold and 28 other members of the Florida Aviation Historical Society. The replica was piloted on its first and all subsequent flights by Edward C. Hoffman. The initial flight was made on October 9, 1983. About 30 to 40 more short flights were made to "work out engine and chain problems, as well as weight and balance questions," according to Hoffman. A flight from Lake Tarpon to St. Petersburg was made just before Christmas 1983. At 10 a.m. on New Year's Day 1984, Hoffman took to the air to commemorate the Jannus flight of 70 years before. The replica was flown about seven times more at Tarpon Springs to make an Imax film that was then shown at the National Air & Space Museum in Washington, D.C. The replica's total flying time was six hours, 40 minutes, and it never flew again. The Chevrolet engine was later replaced with a light wooden replica of the original Roberts for display purposes. This replica of the historic Benoist No. 43, an original Benoist propeller, a pennant that had been tied to the plane and a 1914 newspaper carrying the area's most exciting aviation story of the time are all on display in the Benoist Pavilion at the St. Petersburg Historical and Flight One Museum. The birthplace of scheduled air transportation is memorialized by a plaque that was dedicated on October 12, 1957, by Pinellas County authorities. It reads: "Here, in this county, Thomas W. Benoist, pioneer airplane builder, first proved to the world that the amazing new invention, the flying machine, could be put to work for the benefit of mankind." Contributing editor C.V. Glines is an award-winning aviation writer and a frequent contributor to Aviation History Magazine. Further reading: Jannus, an American Flier by Thomas Reilly Published by the University Press of Florida in 1997. The World's First Airline, by Gay Blair White; and World Encyclopedia of Civil Aircraft, by Enzo Angelucci. 1908: (Thomas and Charles) Benoist Aircraft Co, aka Aeronautic Supply Co, 6628 Delmar Blvd, St Louis MO. 1911: Benoist Airplanes/Benoist Flying School, Kinloch Field, St Louis. 1912: Benoist Aerial Exhibition Co. Jan 1915: Benoist Aeroplane Co, Chicago IL. 1915: Unresolved merger with St Louis Car Co, to build seaplanes for export. 1917: Benoist Aircraft Co, Sandusky OH (Roberts Motor Co). June 1917: Production ended at Benoist's death, at which time Benoist companies reportedly had produced 106 airplanes. 1910 = 2pOB; 50hp Roberts pusher. Tom Benoist-modified Curtiss headless design. POP: 1. 1912 = 2pOBFb; 100hp Hall-Scott pusher and a chain-driven propeller; span: 45'0" v: 65. $4,250. Design, modified from the previous headless, also featured a small motor in the hull for surface power. POP: 1. 1912 = 1pOB; tractor motor. Tom Benoist, Tony Jannus. POP: 3. Reportedly crude in construction, and with framework fuselage, Jannus used one for exhibition flying. Design likely was prototype for Model 12. Benoist C (Smithsonian) C 1915 = Larger, 6p twin-engine version of Model 14 with two 100hp Roberts pushers. E 1915 = 2pOBFb; 75hp Roberts pusher. Similar to Model 14. Headless 1911 = 2pOB; 75hp Roberts pusher; span: 30'0" length: 22'6" v: 68/x/31 range: 180; ff: Dec 27, 1911 (p: Tony Jannus, who qualified for his pilot's license with that flight). Tom Benoist, Tony Jannus. Wingtip ailerons. $3,950 for land version, $4,150 with floats. Benoist XII with ailerons (Leo J Opdyke coll) Model 12, Land Tractor, Type XII 1913 = 2pOB. Advertised as an "exhibition machine." First with interplane ailerons, then refitted with trailing-edge ailerons. $2,500+. Model 14 1913 = 2pOBFb; 75hp Roberts 6 pusher (later 80hp Sturtevant); span: 45'0" length: 26'0" v: 68/64/31 range: 175. Company's first boat-hull design. $4,250. The first US scheduled air service was inaugurated Jan 1, 1914, as the St Petersburg-Tampa Airboat Line (p: Tony Jannus). Its first passenger, St Petersburg's ex-Mayor A C Phell, paid his auction price of $400 for the privilege of an historic 23-minute flight! Service ended on March 30, 1914, at the end of the three-month contract period after losing money in the venture, but it proved the feasibility of commercial air service by safely carrying 184 passengers on 97 trips. Model 15 (St Louis Car Co) 1916 = OBFb. POP: 2. Model 17 1916 = Probably unbuilt even as prototypes, Benoist tried to interest backers in his 2p E-17 and a more ambitious 8p, 100hp, twin-engine K-17 cross-country transporter shortly before his death. Tractor Hydro 1912 = 2pOBF; 75hp Roberts. Single float, interwing ailerons. Used by Tony Jannus for a notable flight from Omaha to New Orleans, down the Missouri and Mississippi Rivers, from Nov 6-Dec 16, 1912. Stopping at towns along the way for 42 passenger hops and exhibitions, his flight set a new world distance record of 1,973 miles. Flight time: 31h:43m in the same plane and motor -- a exceptional feat in those days! In conformity with the most advanced principles of aero- dynamics and the result of four years' practical aeroplane construction, the new 1912 tractor biplane of the Benoist Aircraft Company has been produced. In the words of some forgotten philosopher, "experience do teach." Modification in design made in the Benoist machine, being those found by every-day flying experience to be the best, has resulted in the design shown herewith. In the new model the question of head resistance has rightly been considered of paramount importance, and has been obtained by inclosing the seats for the pilot and passenger within a streamline body of similar shape to the Nieuport monoplane, which obtained its wonderful speed chiefly by the lessened resistance in the body used. In addition to the body inclosing the pilot and passenger, it is also designed to inclose all control levers and the gasoline tank, so that the only exposed parts are the planes, struts and landing gear. The body is made sufficiently wide to accomodate two passengers side by side on the front seat. This seat is located approximately over the center of gravity of the ma- chine, so that there is no change in trim when flying without passengers. The chief measurements of the new model are as follows: Spread of main planes, 35 feet; length over all, 24 feet; chord, 4 feet 9 inches; area of main planes, 240 square feet; area of rudder, 7.5 square feet; area of elevator, 26.6 square feet; area of ailerons, each, 20 square feet; weight empty, 925 pounds; useful load, 500 pounds. Gallery 1 rear of the motor the passenger and pilot seats are placed such a distance apart that the head resistance is at a mini- mum. The ailerons, elevator and rudder are of the flexing type developed by the Benoist company, the rudder being wholly above the elevator. The landing gear is of the well- known Benoist type, being a combination of wheels and skids united through the medium of steel springs as the shock-absorbing medium. That such a system of shock ab- sorption is satisfactory may be judged by the fact that since its adoption a year ago, not a breakage has been recorded against it. The efficiency of the new model is well attested by its greatly increased speed over the older models of the same horsepower and its much flatter gliding angle. This quality is of greater importance than speed for cross-country flying, for which this new model is primarily intended. The land- ing gear design is such that pontoons for hydro work can be attached without difficulty or other change in the ma- chine. The planes are covered with Goodyear fabric, no.10. The standard size of the gasoline tank has a capacity of 15 gallons, sufficient for two hours' flying. Feed to the car- bureter is assured by an air pressure of about two pounds, maintained in the gasoline tank by means of an automobile air pump. An auxiliary air pump to be worked by hand is also supplied. The pressure on the tank is indicated by a guage placed in front of the aviator. The speed of the motor is indicated by an electric tachometer, placed in full view of the pilot, so that the flight speed is at all times relatively known.